[clear]We've all seen QR codes, and we're starting to get a solid idea of what Augmented Reality (AR) is all about, but now it seems like the next big development comes to us in the form of Articulated Naturality (AN). That's a pretty nerdy sentence, so let me break it down for you. 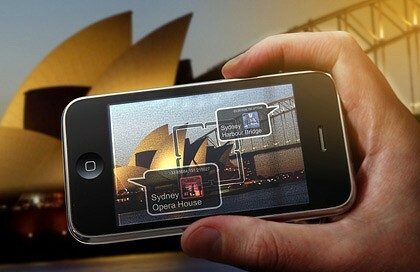 Look at your phone/tablet as a tool that wants to merge reality with the digital world. Downloading the most pertinent apps will give you a plethora of information without having to access a computer or foolishly stumble over your words as you ask a stranger for directions. For example, download an app that reads QR codes, then point your device's camera at it and watch as it redirects you to a predetermined webpage, which is unique to each code. Go ahead, try it out. See how the QR code redirects you to our homepage? You'll notice that companies have been using QR codes in advertisements to cut down on copy and promote their digital presence. It's effective, but already dying off with the advent of new technology. Now take it a step further and imagine if your device's camera recognized everyday objects like buildings or works of art in museum galleries. That's exactly what AR sets out to do. AR lets your device's camera recognize non-computerized objects, which then triggers a response much like what you saw when you scanned the QR code above. Whereas QR codes redirect to a separate webpage entirely, AR allows you to keep your camera focused on the object in question as valuable information about it is displayed. As you continue to scan your surroundings, AR will continue searching for recognizable triggers and display new information accordingly. While AR is without a doubt revolutionary, there are two additional steps that can be taken to improve both the technology and the experience. Lucky for us, we live in an age of technological wonder, so both are in the works right now. The first is called Articulated Naturality and it strips the flatness away from AR. Articulated Naturality is capable of analyzing everyday objects and interacting with them in real time, giving you the most up-to-date information about your surroundings. Say you missed your evening flight out of New York and you need to find a hotel room for the night. You head back to Manhattan for some late-night sightseeing and start scanning the skyline for hotels with your phone. The Augmented Reality feature on your device will let you know whether or not you're looking at a hotel by recognizing the predetermined triggers, but it won't give you much additional information. Here, the wonder of Articulated Naturality kicks in, not only telling you if you're looking at a hotel, but also whether or not that hotel has any available rooms (and which floor they're on, along with photos of the room's layout, cost and booking information!). AN serves to analyze the world as one massive scene, recognizing objects within it and creating a virtual universe filled with valuable information in real time. Check out the video below to see it in action. You’ve probably heard an opinion that cheap custom essay writing services do not exist. A thought that high-quality service costs a lot is quite widespread nowadays. We are ready to destroy this myth! We’ve dedicated our work to writing custom essays and helping students all over the world. In order to make writing service even more affordable we provide you, our new customer, with a wonderful price policy and give you an opportunity to save money. Is your mind blown? Well, imagine taking this even one step further. Google has been working on a project called Google Glass, which is simply a pair of lightweight glasses that relays these same digital functions into your field of vision as you live your daily life. Think of it like a heads-up display similar to what fighter pilots use. Now it's really just a matter of opinion whether or not it needs to be taken this far, but it is an incredibly interesting concept to see coming to fruition, especially when you consider that an 8MB RAM upgrade cost $129 in 1996 and Google Glass is projected to cost just $1500 (and yes, I said megabytes). Technology has certainly come a long way. Who knows, maybe Google Glass will even be developed as a contact lens someday.